Terry joined the Army in 1985 and has a rich military family history. His brother, father, uncles, grandfather and great- grandfather have all served in conflicts dating back to the Boer War. Terry initially served with his father’s Regiment, The Royal Anglian Regiment, before transferring to the Royal Artillery. In 1994 he was injured from a blast whilst serving during Operation Banner in Northern Ireland. The back injury didn’t heal properly and lead to chronic long term pain which also affected his mental health and family life. Terry recalls: “It was really difficult because people thought I was just blagging it because they couldn’t physically see my injury. At the time I was trying to go forward in my Army career but I was finding it difficult to run and even walk at times but used to just push through the pain and try and continue. It was really hard for my wife and I guess it rubbed off on the kids.” It wasn’t until 2010, after long periods off sick, that Terry finally had a back operation and began the process of recovery. 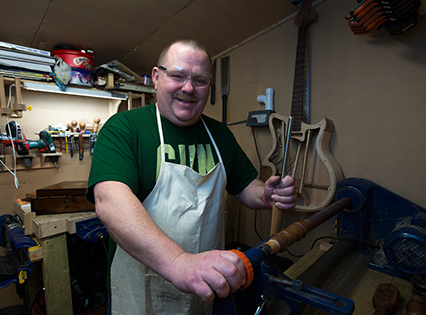 Terry decided to pursue a career in cabinet and guitar making “I quickly realised that I was happiest when I was making something with my hands. I had a bit of an engineering background before I joined the Army. There is something cathartic about working with wood which I had never appreciated”. Terry applied to go on a 3 month cabinet making course but did not have the funds to pay for accommodation. A grant from The Soldiers’ Charity covered these costs thus enabling him to go on the course. We also funded a Vocational Rehabilitation Course which gave Terry bespoke support in CV development and confidence building so he could make a successful transition to the civilian workplace. We were also able to give funding to Terry’s wife Angie so she could learn to drive. Due to his back injury Terry found driving extremely uncomfortable and with six children it was vital that Angie also had this skill; our grant covered the cost of lessons and she has since passed her test. Terry was discharged from the Army in 2012 and now makes bespoke furniture and guitars and does book binding in his own private workshop. He is very grateful to The Soldiers’ Charity for the assistance provided explaining: “If it wasn’t for The Soldiers’ Charity giving me that money to cover the accommodation costs I would’ve never done the course. I was just elated; it was such a weight off my shoulders. My family saw a massive transition in me. The Charity also paid for driving lessons for my wife because I can’t drive any great distance due to my injury, it helped me for her to be able to drive”. By making a donation you can help a former soldier like Terry make a successful transition from military to civilian life. Click here to donate. It's thanks to the generosity of people like you that we can continue our vital work with soldiers, veterans and their families. Help us continue supporting veterans like Terry by making a donation today.